This weekend was a pretty productive one in the kitchen. :) I remember how there was a period sometime towards the end of the year last year when I used to back practically every weekend because it was something cathartic and stress-relieving...but that was also when I was still a student and have weekends off to rest and supposedly study. Ohh the sheer luxury of a weekend off. Yes, it's the case that weekends now are no longer a guarantee for rest and that's probably one of the few things I miss about being a student. That, and the fact that as a student, if you aren't up to going for lessons, you really can just take a break for the day without any consequences to bear. But now, even taking sick leave is pretty impossible because there's the real concern of how everyone else left behind is going to have to take up your share of the workload. Moral of the story is, if you're a student, enjoy your days of insouciance and inconsequentiality. So recently, I've started exploring a little more about a vegan diet, and by exploring, I really mean reading The Kind Diet , a book written by Alicia Silverstone (whom I used to have a huge girl crush on back in the days of Clueless)(I mean who didn't love her??) that is part memoir, part crash course in the nutritional aspects of a vegan diet, and also a recipe book with tons of recipes that look so delicious. After watching youtube interviews of her explaining about her decision to turn vegan and how she went about doing so, it definitely got me thinking about how this is a possible lifestyle that I might want to lean into in the future. Everything started with the book, Eating Animals, by Jonathan Safran Foer, that was the catalyst for my pescatarian diet change, and it seems that more and more I find myself thinking about the meaning of the choices I make when it comes to my diet. Like Foer mentioned in his book, he started exploring the topic because he wanted to be able to explain to his son (a new born at the time) why we eat the way we do, because not only do our choices reflect who we are but they affect our children in ways that we can't entirely control. And it does seem a little finicky to just say, oh I eat all kinds of meat but not dog meat because dogs are cute. It just seems insane how the food industries have been driven by the very fickle and subjective taste preferences of humans. I mean in a parallel universe, if humans weren't at the top of the food pyramid, it's plain sad to be at the mercy of some animal because of a random taste whim. But ok, this discussion could go on forever, and in the words of a dear carnivorous friend of mine, he'd just end it off by going, "Humans rule. 'nuff said", and go back to stuffing his face with pork ribs. Last thursday, when I had the amazing good fortune of a random afternoon off, I decided to try out some recipes in The Kind Diet cookbook - namely the vegan berry cheesecake and the oatmeal-nuts-dried plum cookies. 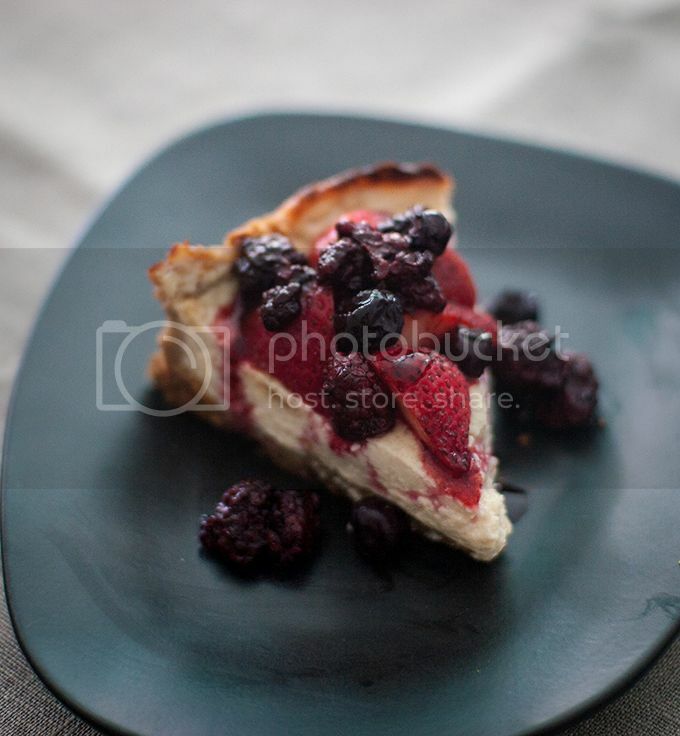 The vegan berry cheesecake looked so good in the photos and I was so excited to try out some new vegan ingredients, namely Earth Balance butter that is kinda expensive >< but I was really curious to see what it would look/taste like. Managed to get it at this incredible organic food store called Supernature at their Orchard Boulevard outlet and boy was it INCREDIBLE. They have racks and racks of organic items and I'm tempted to spend a proper afternoon there just browsing the aisles to see what's on offer. Back to the Vegan Berry Cheesecake, recipe available HERE. PLUS POINTS - I really like how it makes use of silken tofu, which is definitely healthier than the usual whipping cream/truckloads of refined sugar/sour cream combination. But I couldn't actually find any non-dairy cream cheese (yeah, is there really such a thing?!) in the supermarkets so the cheesecake ended up being half vegan only. 1. You need to drain out as much water as possible from the silken tofu before incorporating it into the batter. I might no have been so careful with that, so in the end my batter kept bubbling slightly in the oven, which definitely affected the baking consistency. Most of the time it looked like the top layer was getting baked when the deeper portions were still molten. 2. These tofu cheesecakes need time to harden up! They ain't going to be hard immediately when you take them out from the oven so give them time to harden as they cool off to room temperature + with refrigeration. I was soooo disappointed at first when I thought that the cheesecake was a gone case because when I took it out after an hour in the oven, it was still 70% molten beneath the surface. :( I was all ready to dump it but then I decided to stick it outside to cool off for about 1-2 hours, before I chucked it into the fridge, hoping that it would eventually harden up overnight. WHICH IT DID. So I suppose the point is, don't rush these cheesecakes. That said, for this one, the berries definitely saved the cake - both in terms of taste and looks. It's definitely not as rich as a typical non-vegan cheesecake because the tofu makes it so much lighter and softer, but it was pretty decent and felt healthier. Not too sure that I would make it again though because of the traumatic - why is it not hardening up!! response I had initially. Ta-dah. :) I'm thinking the next cheesecake I'll try will definitely incorporate tofu again but with the other typical dairy products. I suppose at this stage, I'm not ready to go vegan in terms of my baking ingredients. I will definitely be aiming to replace the refined sugars with healthier alternatives like brown rice syrup and maple syrup but in terms of the essential ingredient - butter, I'm still going to be sticking with my french butter for the time being. 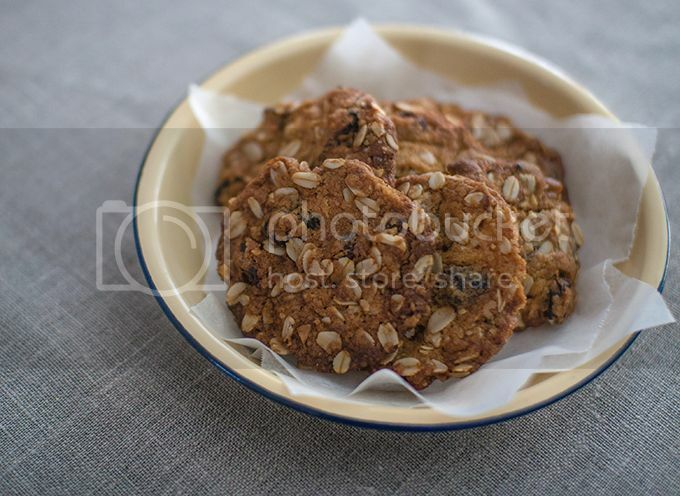 Another recipe I tried was the Oatmeal, Walnut and Dried Plum Cookies (RECIPE HERE. This was definitely more successful than the cheesecake in that I didn't have so many problems with it coming out of the oven. Only thing is that these really EXPAND in the oven! I should've kept the cookie dough portions to 1 teaspoon large portions rather than the tablespoon ones as listed in the recipe. ;p Because the larger ones ended up rather MASSIVE and were so weak that they broke easily when I tried lifting them off to the cooling rack. The smaller ones were just right and retained some crunchiness at the edges. Added in raisins as well to these cookies. OOh boy, where did the night go? Time to listen to some music before bed. Here's a song that I simply adore now. And don't you think the lead singer's voice is like silken tofu?